Guildonian Players: Blithe Spirit - our spring production! Blithe Spirit - our spring production! Written in the darkest days of the Second World War, and subtitled by the playwright as ‘an improbable farce’ it shows a determinedly frivolous attitude to morality. The play was first seen in the West End in 1941, creating a new long-run record for non-musical British plays of 1,997 performances. It did well on Broadway and over the decades has been made into a musical, a television adaptation and for radio, returning to Broadway and the West End several times - most recently in 2014. 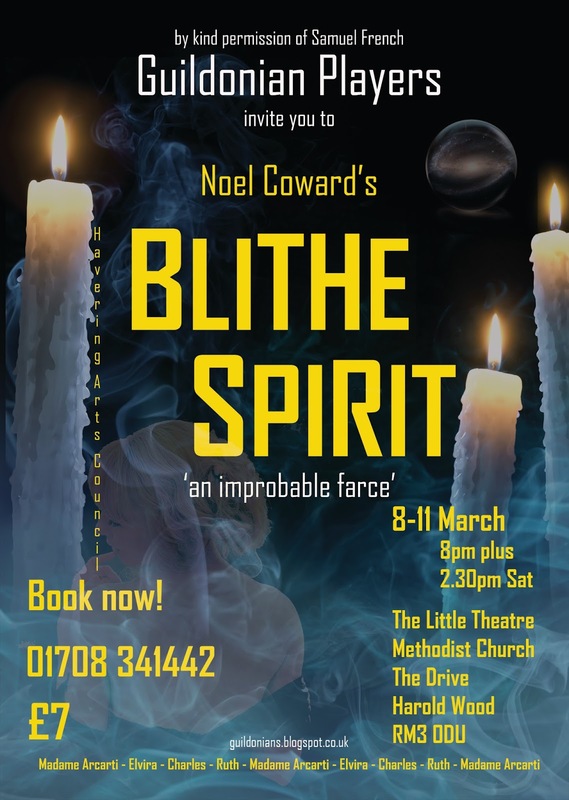 Our Blithe Spirit runs from Wednesday 8 to Saturday 11 March at The Little Theatre, with evening performances at 8pm. There is also the popular Saturday matinee at 2.30pm. In rehearsal! Why not book your seats now?